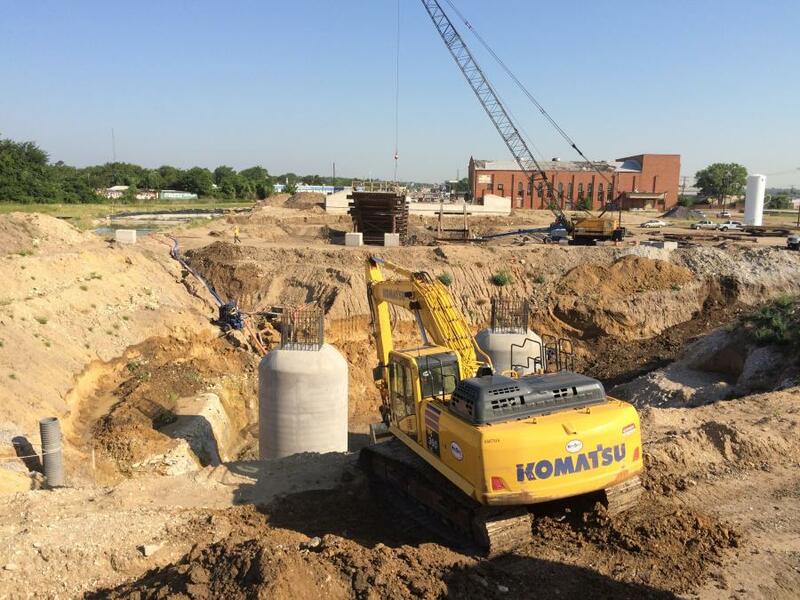 Construction crews in Fort Worth, Texas, are creating the foundation for what will be a unique, pedestrian-oriented urban waterfront district. Three V-pier bridges positioned along the realigned Trinity River are currently being built, at a cost of $66 million. The undertaking is a first for Texas, and is a collaborative effort between the Trinity River Vision Authority (TRVA), TxDOT, city of Fort Worth, Tarrant County and the U.S. Army Corps of Engineers (USACE). TRVA is responsible for the implementation of a public infrastructure project which provides needed flood protection and fosters the development of Panther Island. The Central City Project is on schedule for completion in 2028. Most of the work that’s been done involved prepping the project area for vertical construction. This included environmental remediation, utility relocation and valley storage sites. All three bridges are expected to be finished in 2020. Immediately following their completion, USACE will begin construction on the 1.5-mi.-long bypass channel running directly under the new bridges. Following the channel construction will be the three locks. In the event of a flood, these gates will divert water through the bypass channel, allowing the interior levees to be decommissioned. In addition to the gates, a downstream dam will be created. The final piece will be the 33-acre town lake expansion. “Flood protection for Fort Worth is the basis of this project,” said Oliver. “During the design phase, the Corps of Engineers decided to build a 40-1 scale model of the future bypass channel, rather than relying on computer modeling. The scale model proved to be very beneficial for project engineers, and saved nearly $10-15 million dollars in the process. 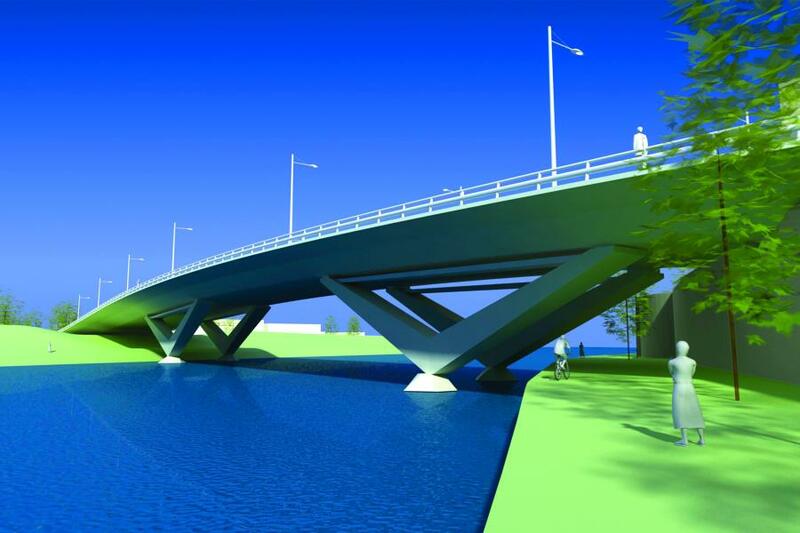 The signature bridges are named for the V-shape of the support pier that will be visible above the water. During construction, a drill shaft is bored 30 ft. underground, then a steel-reinforced concrete pier column is constructed above ground with a rounded crown at the top of the column. This dome-shaped design is visually more appealing than the column alone. The dome also will serve as a connection point and seat to the actual V-pier. The V-piers will support the superstructure of the bridge, which will connect traffic from one side of the bypass channel to the other. The three bridges will ultimately serve as a piece of public art. World-renowned architect Miguel Rosales designed the signature V-pier structure with Freese and Nichols Inc. of Fort Worth. The design complements structures in the city’s cultural district, including the local museum. The V-pier design provides better bridge support with fewer piers. Fewer piers mean less concrete and less obstructed views from the river. Numerous conceptual design workshops were held with all project stakeholders, including a 50-person citizen’s advisory committee. The preferred design was a unique V-pier bridge with a slender concrete superstructure, long cantilevered overhangs and dramatic V-piers spaced 220 ft. apart. 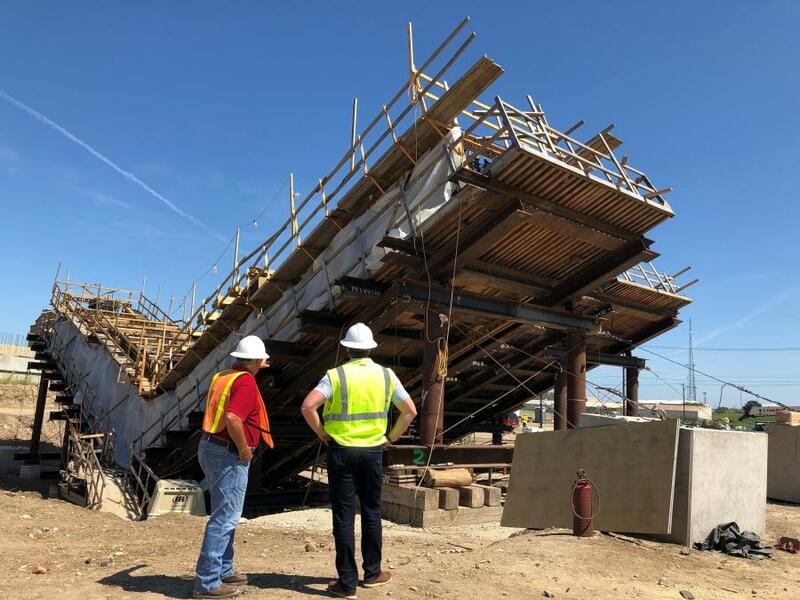 According to Val Lopez, TxDOT spokesperson, the construction of V-pier bridges involves primarily cast-in-place concrete structures that utilize post-tensioning for structural stability. The work starts underground with significant drilled shafts for support of the above-ground bridge elements. The contractor builds the pier caps on top of the bridge drilled shafts to serve as the base for the V-pier supports. Lopez noted the most important aspect when building V-pier bridges is their structural complexity. “The construction inspection team has to ensure that the contractor is building the bridges according to design plans and meeting or exceeding the various applicable standards and specifications. One key requirement is for the strength of the concrete in the V-piers to meet or exceed 9,000 pounds per square inch. The work has included somewhat tedious concrete pours, typically carried out after hours. V-piers require mass placement of concrete, which is easier to accomplish during evening temperatures. Working at night also is better for the crew, traveling public and area businesses, by avoiding material delivery issues related to traffic congestion on project-area roadways. Currently, White Settlement work is focused on the superstructure; specifically, building the temporary shoring towers and installation forms for the box girder slabs and webs. The Henderson Bridge is in the construct V-pier legs phase, with three V-piers active right now, while the North Main Bridge is in the Construct V-pier legs phase, with concrete poured in one of the four V-piers, and a second V-pier close to being ready to pour. The Panther Island Project, which has taken years of planning and coordination, has not been without its share of hurdles during ongoing construction, said Lopez. Lopez said building bridges that are innovative and unique is challenging in all phases of project development, including planning, design and construction. Working on three separate bridges at one time is demanding, however, it allows the contractor to utilize materials, equipment and resources in innovative ways. The project includes three bridges, two multi-lane roundabouts and other associated structures. 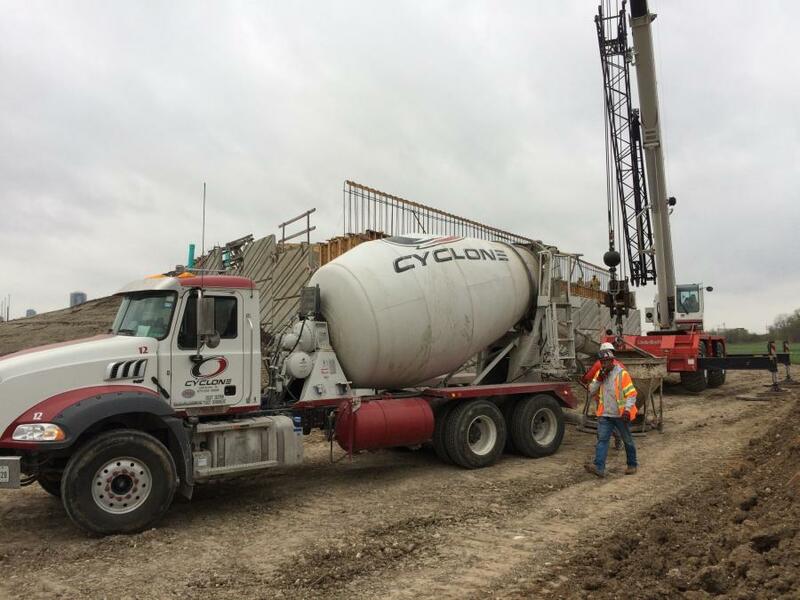 The contractor is using traditional equipment that includes paving machines, loaders, excavators and cranes, along with hydraulic jacks for post-tensioning and other specialty equipment. Materials include concrete used in traditional paving and high-strength for V-piers; steel for reinforcing bars; scaffolding and forms; and lumber for the superstructure forms. Engineers, architects and planners teamed with partners from around the community to develop the innovative design for the bridges, which are only part of the project that will enhance the area with 10-ft. pedestrian sidewalks, bicycle facilities, reduced vehicular traffic delays, enhanced landscaping and opportunities for future transportation. 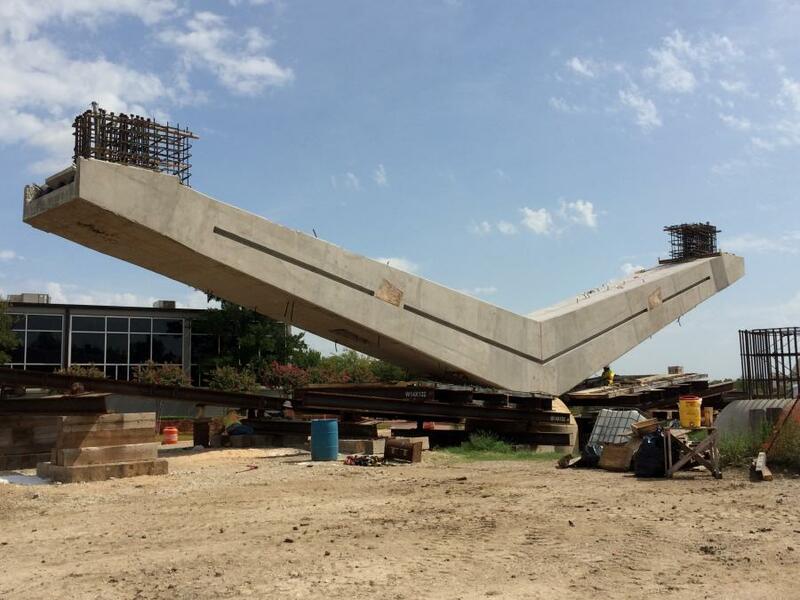 The pedestrian sidewalks on the outside of each bridge superstructure are part of the cast-in-place box girders. The sidewalks will have special stainless steel hand railing with embedded lighting on the outside of the walkway with decorative light poles located on the inside, to provide lighting for pedestrians and motorists. The project includes the use of modern roundabout intersections on Henderson Street and White Settlement Road. This results in handling 20 percent more traffic than a traditional intersection, with half the average delay time/vehicle. It also will provide safer roads by cutting traffic speed by one third, increase intersection capacity from 3,900 to 4,500 cars/hour and create a positive environment for vertical development. Many sustainable methods will be incorporated during project construction, including the reuse of materials for construction of the public infrastructure, pump stations built to manage river flow, low-maintenance greenscapes utilized in public spaces and flood gates for controlling water quality by utilizing energy from the river to provide flushing flows that will maintain optimal river quality for waterways within Panther Island. An innovative storm water management system replaces conventional underground conveyance systems to handle storm water runoff through a series of canals. The development standards and guidelines allow incentives for the construction of LEED-certified buildings within Panther Island, and will require the use of quality materials in new construction. Panther Island is expected to generate more than 29,600 full-time workers in the area, contribute close to $4 billion in annual economic activity to the region, increase the tax base by more than a billion dollars from $129 million to $1.3 billion, connect the downtown area with the cultural district and add 12 mi. of developable waterfront in the central business district.